Clifford Stanley Rooks was born in Yeovil during the summer of 1899. He was the son of railway signalman John Rooks (b1871) and Clara née Osborne (b1876). In the 1901 census John and Clara, together with their two sons, Henry John, known as Johnnie, (b1898, d pre-1911) and Clifford, and a boarder, were living at 9 Stars Lane. John and Clara were later to have two further sons; Willie (b1904) and Gordon (b1906). When he was aged fourteen, Clifford went to work for AG Gould of West Coker where he learned a trade for 3½ years, before enlisting. The Rooks family lived at 73 Eastland Road. Clifford enlisted at Yeovil when he turned eighteen in the summer of 1917. He became a Rifleman in the Rifle Brigade and was posted to 1st/28th Battalion, London Regiment (Artists' Rifles). His Service Number was 41195. The original 28th County of London Battalion (Artists' Rifles) mobilised on 4 Aug 1914 at Dukes Road, Euston Road and as 1/28th became part of London Division Army Troops in the St Albans area. In October 1914 it deployed to France , becoming an Officer Training Corps at Ballieul and in April 1915 at St Omer. In June 1917 the battalion was part of 190th Brigade, 63rd (Royal Naval) Division. The 1st/28th Battalion, including Clifford, took part in the Second Battle of Passchendaele (26 October to 10 November 1917), a phase of the Third Battle of Ypres. The battle took place in the Ypres Salient area of the Western Front, in and around the Belgian town of Passchendaele. On 30/31 December 1917, German troops dressed in white camouflage suits surprised British battalions in snow on the southern part of the Cambrai front. A difficult defensive action took place, the Action of Welch Ridge, subsequent to the Cambrai operations, in which Clifford's battalion was involved. The next major action involving the 1st/28th Battalion, was the Third Battle of Albert (21-23 August 1918). This battle was significant in that it was the opening push that would lead to the Second Battle of the Somme. This attack opened the advance, with the main attack being launched by the Third Army along with support from the Fourth Army. The attacks developed into an advance, which pushed the German 2nd Army back along a 50-mile (80 km) front line. On 22 August, the 18th (Eastern) Division took Albert, with the British and Americans advancing on Arras. Within a week of the battle, on 27 August 1918, Clifford Rooks was killed by a shell. He was aged just 19 years. The Western Gazette, in its edition of 8 November 1918, reported "Mr John Rooks of 73 Eastland Road, has been informed that his son, Rifleman CS Rooks, Artists’ Rifles (London Brigade), was killed in action in France on August 27th and the intimation was also conveyed to him the sympathy of the King and Queen in his loss. 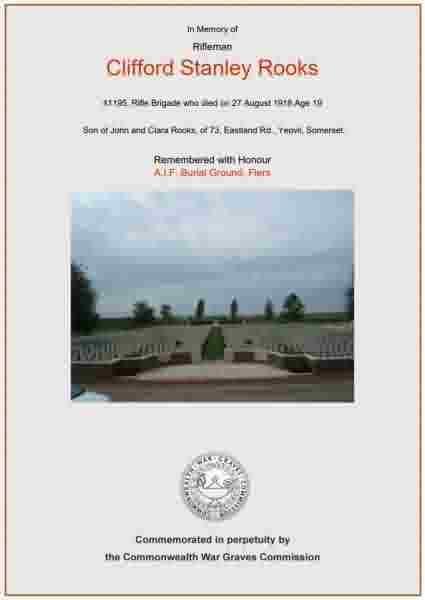 A letter to Mr Rooks, from the Chaplain of the Battalion informs him that Rifleman Rooks was instantly killed by a shell, and was buried by him with six of his comrades in a large grave close to where he fell near the village of Thilloy, south of Bapaume. A cross had been erected to their memory. He expressed the regret of the officers and men of the Company at the death of a brave soldier who would be missed by all who knew him. Private Rooks was 19 years of age, and previous to joining the Army at the age of 18, was employed in the works of Mr AG Gould, of West Coker, where he had been learning the trade for 3½ years. Clifford Rooks was interred in A.I.F. Burial Ground, Flers, Somme, France - Grave XI.L.1. and his name is inscribed on the War Memorial in the Borough. The Commonwealth War Graves Commission certificate in memory of Clifford Rooks.